Socorro: Approximately the same age as the couple. Scene setting: Those of the scenes. Type of theater: Humorous drama about ambition, obsession with winning, with being number one and making dreams come true no matter the price. Dramatized reading: Arriage Theater in Bilbao under the direction of Mikel Albisu. 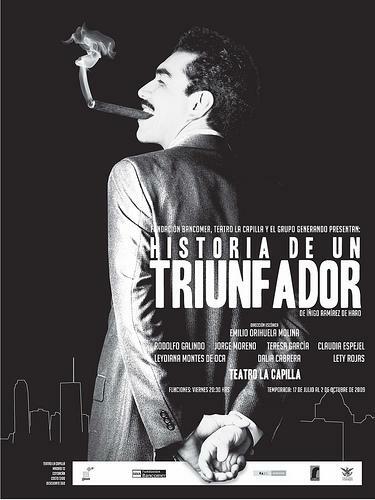 Productions: Opening at the La Capilla in Mexico by the GENERANDO company, directed by Emilio Oribuela with Rodolfo Galindo and Teresa García among others. 17 of July, 2009. “A long time ago I wanted to direct a contemporary theater play which would critique without ever managing to be libelous or a theater of denunciation… And this one does just that, because it critiques with dark humor, acidic, strong and with guts… A vertiginous rhythm (that) generates an anxiety within the audience to know the denouement. “ Derby Roberto Arboleda, first director of the play.